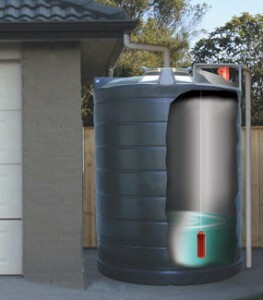 Considering Rainwater Harvesting? Read these FAQ! The principle has remained unchanged for centuries. 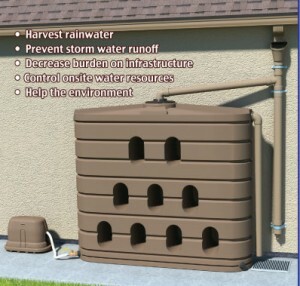 Efficiently capturing, diverting and storing rainwater converts it into a sustainable resource. Modern containment methods have developed into a green technology that’s easily adapted for homes, commercial buildings and agricultural sites. Harvesting rainwater reduces reliance on municipal water systems and eases their dependence on lakes and aquifers. It supplements rural properties that rely on ground wells by eliminating the need for expanding distribution infrastructure. Rainfall on your roof drains into gutters, and that’s where the harvesting system starts its work. Downspouts direct flow through a filtering washer barrel that connects to underground pipes leading to the storage tank. Depending on the type of system installed, there may be additional filtering components, pumps and pressurizing equipment. The collection tank stands as the heart of the system with capacities ranging from 5,000 gallons to commercial structures holding up to 100,000 gallons. Applications for captured rainwater range from storm-water abatement and crop irrigation to home landscaping and potable water supplies. The resource is pH neutral, so it reduces scaling and corrosion in appliances and plumbing, and it provides natural insurance against municipal water drought restrictions. After initial equipment installation, system maintenance and costs are minimal. You enjoy a reduced carbon footprint with simple technology that helps conserve a vital Texas resource. Which Factors Affect Your Decision? Do you want a rain capture system that supplies irrigation for your landscape or doubles as a source for potable water? Will it supplement or replace an existing well? Your roof’s material and square footage figure into initial designs as well as plumbing infrastructure and your anticipated usage volume. Our teams outline the details and explain all your options from storage tank location to pump requirements. We offer custom proposals that help you decide on the best system for your property. Rainwater containment systems aren’t meant to replace your water supply, but they make a significant difference in consumption. The amount of rain you collect depends on your location in the state as well as weather patterns, but conservative industry standards support an 85 percent efficiency rate in runoff capture. According to the Texas Water Development Board, a property owner in Austin can expect his rainwater collection system to harvest more than 30,000 gallons annually. Since 2002, Accurate Leak and Line has provided premium plumbing services to homes and businesses throughout Texas and the neighboring states. We’re uniquely positioned to design and build custom rainwater harvesting systems that work for you and the environment. Contact our teams today for more information about our innovative planning and custom installation processes.